No Christmas theme bento for today. But I posted the pancake instead. I made the pancakes for the kids this morning using my other cute pancake pan, Doraemon. Yes, you read it right! I just couldn't resist to buy these cute pancake pan when I had a trip to Taiwan. I posted Donald Duck pancakes before here. 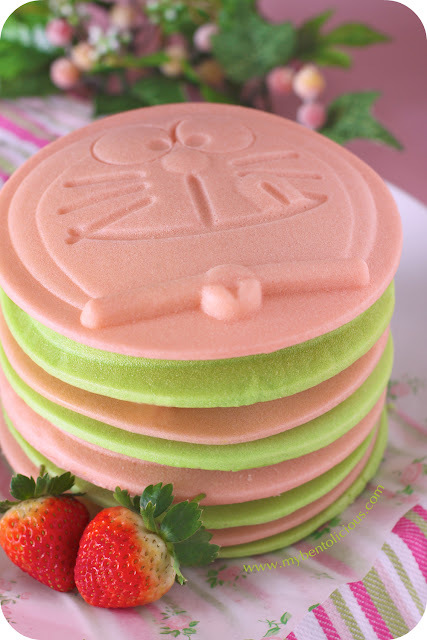 Last week when I went to a baking supplies shop, I bought strawberry paste and pandan paste that is commonly used for baking cookies, cake or bread. 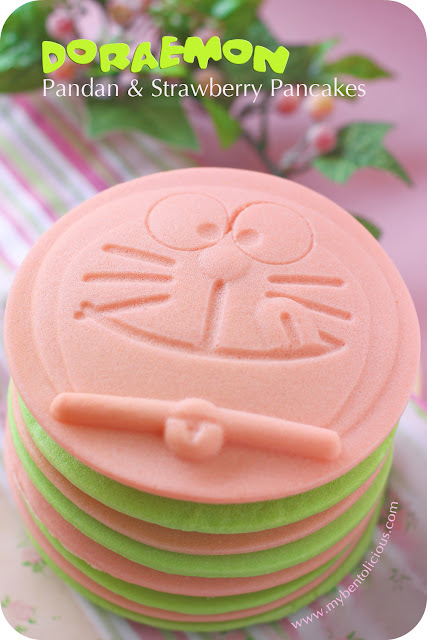 So I thought it will be cool to make 2 colors Doraemon pancakes this morning. The paste didn't just bring out the color but also the strawberry and pandan tastes too. This is perfect for Christmas breakfast with 2 tones colors, more festive feel I think. I used Pillsbury pancake ready mix and pancake syrup. Is easy to make and quick too. Mixed all the above ingredients in the bowl until even and no lumps. Hi Lia, nice color tone...! how to make it even..? i meant after cooked? sometimes, mine turned out half browned/burnt. Is it due to the factor of fire or the pan? You are so good in making these, everything look so smooth, just like your egg sheets! Salute!! @shaz : Thanks a lot! Those are amazing! The color is perfect and the photo is wonderful. Wow! I am in awe :) Beautiful job! you are my idol Lia! Hope in the near future you will publish a bento book with all your wonderful bento creations here in your blog. your food photography is so professional looking. very very pretty! Omigosh! They are so fabulous, perfect and the colors are really beautiful! @Rio : Aww I'm blushing now hahaha ... Thanks a lot dear! Such cute pancakes! The colors are so soft and pretty. These are just to cute to eat! What fun it must be to be a kid and eat at your house! These are just as smooth as your egg sheets. Amazing how you do that! I try to get pancakes like this constantly and fail because they always have brown on them or bubble somewhere. Great job!! Love the vibrant pink and soft green theme, looks so fresh and happy...and perfectly made, of course! oh my those are amazing and look so light and fluffy inside. The pancake pan is precious! Wow it's so pretty and cute! How much was the pancake pan? Sooo cute. And they look so even and perfect. @Mi : Thanks a lot Mi! When I bought it is about TWD (Taiwanese Dollar) 1,000. Gosh! You don't just always have perfect egg sheets, now even your pancakes are soooo perfect! @Allie : Thanks a lot Allie! @Yeapies : hahaha ... Thanks a lot Yeapies! Wow, so nice and perfect! Love the color combination too. @Shanie : Thanks a lot Shanie! Hi Lia, i've tried this Doraemon pancake (yes you did inspired me, dear) but i turned out not as lovely as yours ( hiks...hiks.. ) ca u show us the pan? maybe I got the wrong pan. LOL blame it on the pan.